Rack Toys: Cheap, Crazed Playthings is my favorite type toy-history book: colorful, easy-to-read, and chock full of fun photography. The book has secured a permanent place on my coffee table, right next to The Official Guide to Disco Dance Steps (an entirely different story), and it never fails to generate a nostalgia-fueled discussion or two when someone picks it up and starts thumbing through it. Over the course of 144 pages, author Brian Heiler has paid tribute to an oft-forgotten niche of off-brand, easily breakable, and ultimately disposable plastic toys that were typically available in supermarket checkout lines, variety stores, and pharmacy shelves. Rack toys were the kind of cheap impulse purchases that parents (like mine) often used to placate young children (like me) during shopping excursions. Heiler has divided the book into seven chapters, each representing a sub-genre of novelty toy goodness, including superheroes, scary monsters, Saturday morning cartoons, and television shows. As each chapter unfolds, it becomes apparent that the period of rack toys covered in the book (1950s-1990s) was like the Wild West of toy licensing. Companies like Azrak-Hamway International (AHI), Imperial Toys, and Larami flooded the market with products at a time when licensed character branding standards were non-existent or simply not enforced. Lax attention to licensing also opened the door for some questionable tie-ins. For example, in Chapter 1, Comic Action Heroes, Heiler includes an eclectic mix of rack toys featuring classic DC and Marvel superheroes. And while it may be tempting to question whether Batman and Robin ever really employed a “space probe” as part of their crime fighting arsenal, or when exactly The Incredible Hulk hopped on his “stunt cycle” or sat behind the wheel of his “zoom-powered” van, these types of questions are better left unasked and certainly unanswered. Of course, this theme continues throughout each subsequent chapter, with Heiler playfully documenting an array of bizarre product choices and creative packaging that retailers used to make a quick buck. 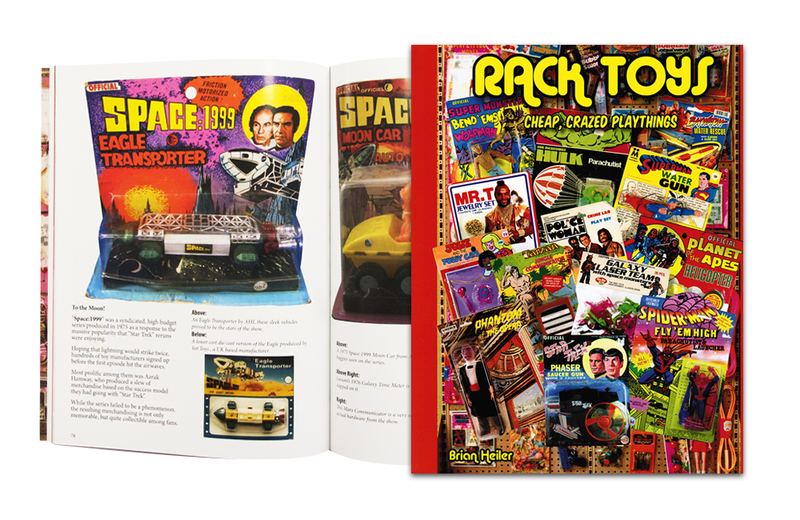 Reading your way through the Frankenstein Glow Putty, Space 1999: Eagle Water Gun, and Laverne & Shirley Secretary Set leads to the last (and my favorite) chapter: Hey, Knock it Off – because even rack toys aren’t immune from cheap knock-offs. Now, if you’ll excuse me, I need to dig up my Super Friends Swim Goggles for my upcoming trip to Florida.